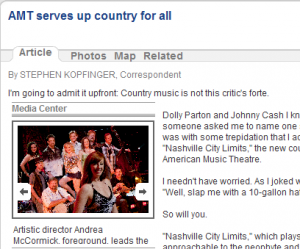 Home > News > News > Nashville City Limits Explodes at AMT! Nashville City Limits Explodes at AMT! According to Stephen Kopfinger of the Lancaster Sunday News, audiences “had a lot to applaud” at opening night of Nashville City Limits on Friday, May 7. “Thirty-six songs are covered in a brisk, breezy two hours,” and the show provides a good time for neophytes and established fans alike. Nashville City Limits is on stage at AMT for a limited time, so don’t miss out! Click here, or the graphic, to read the full review. Click here to purchase tickets to Nashville City Limits!